“Teach me knowledge and good judgment, for I trust your commands” (Psalm 119:66). 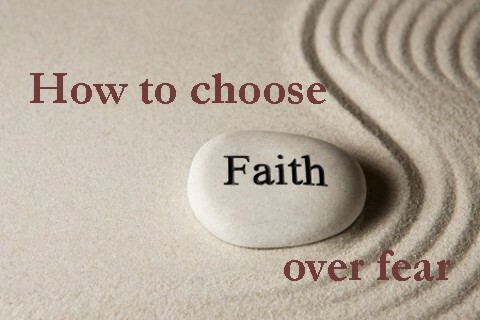 Knowing God’s word is the foundation and beginning of choosing faith over fear. Our knowledge of the Bible can be a deciding factor in the strength or weakness of our faith. It’s our knowing what God’s word says that gives us the courage to boldly stretch our faith in trusting God for the impossible. We look to the examples of our forefathers and foremothers in the faith as a testimony that God is able to help us overcome our fears in adversity. We must commit ourselves to obey God’s word with our actions. Our practice of obeying God’s word gives us confidence when we are confronted by fear. Fear can be paralyzing, but faith is energizing when we put God’s word into action. The more we step out in faith in obedience to word of God with a pure heart—the more our faith grows in the Lord and we are less afraid of the unknown. “No, the word is very near you; it is in your mouth and in your heart so you may obey it” (Deuteronomy 30:14). There are times we need to simply speak out loud what the Bible teaches in the face of fear. Fear breeds on our doubts in the silence of our thoughts. Yet in contrast, our faith is strengthened and grows out of our spoken confidence of God’s truth. There’s something about repeating the Holy Scriptures that helps us to push forward when we want to give up. We speak the words within and out loud bolstering our faith and quieting our fears. “For everything God created is good, and nothing is to be rejected if it is received with thanksgiving, because it is consecrated by the word of God and prayer” (1 Timothy 4:4-5). Some of the best prayers we can pray come straight from the Bible. Prayers of Moses, David, Daniel, Paul, and best of all—Jesus serves as great examples of how to get our faith over the mountain of fear. Many of the cries out to God in the book of Psalms were written in desperate fearful times causing the author to remember the goodness and grace of God. We can also search the scriptures for the promises of God to build our faith up when we are feeling low. Praying God’s word on a daily basis builds a fortitude of faith that crushes fear. “Jesus answered, ‘It is written: ‘Man shall not live on bread alone, but on every word that comes from the mouth of God’” (Matthew 4:4). A believer who knows, obeys, speaks, and prays the Word of God—will live it out in faith and not fear. The choice of faith becomes easier as we become overwhelmingly confident that God will do as He says in His word—fear just isn’t a viable option. As we live out our faith, the Holy Spirit brings a greater assurance in our hearts. Through a renewed hope in God, we become more attuned to His will and unafraid to move in His direction. It is through the constant use of God’s word that matures our faith to the point where fear is no longer the deciding factor in our lives. We know that fear brings torment, but perfect love drives it away. As we long for the Word of God more than our necessary physical food—His love will be perfected in our hearts. The faith within our hearts builds from the foundation of love from God. Faith based on the teaching, reading, and hearing of the Bible has the best possibility of overcoming fear. By choosing the Word of God, we choose faith over fear.